Save yourself from costly upgrades in the future and purchase this Tribrid DVR to accommodate all the latest camera technologies that are here to stay. Not only can you upgrade to high definition megapixel cameras, you can also keep your older BNC standard definition cameras recording on the same machine. 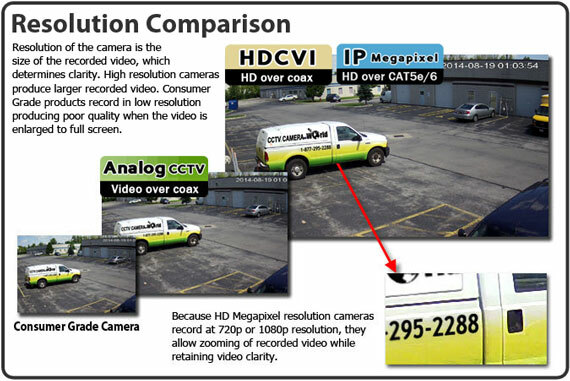 You can record any combination of HDCVI and Analog cameras totaling up to 8 cameras, or you can record a total of 2 IP cameras and 6 HDCVI or Analog cameras. This 8 camera Tribrid DVR has all the same great features as our NVRs and DVRs that customers love. It is a standalone DVR recorder, meaning it does not need a PC to function. In fact it is a computer in its own right, with a dual-core embedded processor that is more powerful than most PC computers today. All of our security video DVRs have the industry's leading GUI user interface that is easy to use with point & click operation using the included mouse. Our recorders all use a Linux operating system embedded on a chip that is immune to the Trojans and viruses that plague PC computers. Other standard features of our surveillance camera recorders include the capability to view the attached security cameras over the internet using a smartphone, tablet or computer. Using our free remote view app you can watch your cameras from anywhere in the world! You can also get motion alerts to your phone or tablet which let you click on the alert and playback video instantaneously. There is also functionality to receive email alerts, and upload video to a FTP upon motion detection. As is the case in all of our DVRs and NVRs, motion can be sensed using built-in video analytics or a hardwired security PIR sensor. Can the DVR and cameras be operated remotely? ie: moving cameras, zooming, setting recording etc. Do you mean whether you can connect to the DVR over the internet and view and control cameras? If so, then yes. To move cameras, you need to purchase cameras that have either motorized lenses or are PTZ cameras. You can watch a video on how playback works on our recorders here: How to playback video and backup from your DVR. All units are manufactured by our parent company, Avalonix. Will Tribrid support coaxial (RG-59 Shielded Cable) analog cameras from Q-See? HD SDI cameras are not supported on Tribrid DVRs.